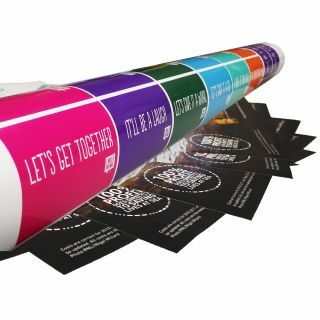 Full colour digitally printed vinyl with lamination (Matt/Gloss/Satin), self adhesive graphics perfect for a variety of applications ideal for indoor and outdoor use. Designed for simple installation and protection, available in standard and custom contour cut shapes. Vinyls can be printed on clear to appear translucent, or backed in white to be viewed as a solid image, and be printed as normal facing or reverse print. Looking for a wall mural or branding on a wall using printed graphics, self-adhesive vinyl is great for this. Quick and easy to apply with no mess. Small format vinyl sticker printing, waterproof and ideal for indoor and outdoor usage. Perfect for quick and easy brand labeling or advertising, versatile and with the ability to stick to a variety of surfaces, making them easy to display. How do I apply my vinyl? Just like a sticker, simply peel off the backing paper and apply the sticky side to the surface of your choice, slowly pressing the vinyl to get out any bubbles or creases. It is worth making sure the surface you are applying to is clean and flat for best results. What's the difference between a vinyl and a sticker? Not a lot, people often use the term sticker to describe a material that can be applied to various surfaces. Strictly speaking the difference would be the material, a traditional sticker would be more paper based, whereas a vinyl is plastic based. Making vinyl stickers better quality and longer lasting.